Today, we live in a technology-driven world where speed, flexibility, intellectual capitaldevelopment, and networks have become the basis of value creation - as connectivityand interactive technologies pervade all business activity. In this technology-driven environment, Keltron finds the assimilation, adoption andintegration of technology in creating innovative solutions as the very basis of survival. Keltron's success has been in making technology work rather than inventing it. Keltronhas been a catalyst in making electronics work in almost every aspect of our daily life,since 1973. Keltron's strength lies in the stable foundation and experience built over the years, itsstrong human capital, its nation-wide network and its agility to adapt itself to change. With over a 30-year long track record as a manufacturer of sophisticated electronicdevices and systems, Keltron presents itself in the global market as a one-stop-shop formanufacturing, system integration, and after-sales-support in India. KELTRON’S history is a saga of innovation in electronics. 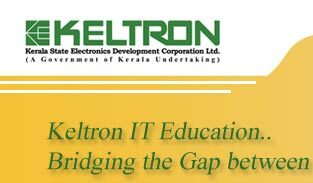 From being a pioneer in 1973, tothe role of a trend-setter today, Keltron has been the catalysis for the development ofelectronics industry in Kerala. The tag line launching a State-owned electronics enterprise, more than a quartercentury ago, read “spearheading an electronics revolution in Kerala”. It was anexperiment by Government of Kerala to transform the laid-back, picturesque KeralaState known for its spices, natural beauty, Kathakali and the Onam boat races, to anarena for industrial and technological development. That was how Keltron was born. Within five years of its inception, Keltron had set up a production centre in every districtof the State. More than 5,000 people were engaged directly or indirectly by Keltron forthe manufacture of electronic goods. The model of a State-owned electronics corporation was so successful that several other States in India followed suit; launchingtheir own electronics corporations. A quarter century later, Keltron after having contributed substantially to theindustrialisation of the State, set about transforming Trivandrum, the capital city ofKerala, into one of the major electronics hubs of the country. Today, the city is home to Technopark, the internationally known technology park wherethousands of talented men and women participate in the development of aburgeoning information technology industry. Thus Keltron has in effect triggered a revolution that still keeps churning out its benefits toindividuals and institutions in different parts of the world, continuing in its quest toinnovate products and processes that would add further value to life and to the industry. Ensuring quality is a continuous on-going process at all production units.Each facility has a Quality Department whose business is to see that all quality norms arestrictly adhered to in the manufacturing process. The manufacturing centers atTrivandrum , Aroor (Near Cochin), Kannur and Kuttipuram (In Malappuram) are ISO9001:2000 certified. Inspectorate of Naval Armament (SINA-T), has implemented theircustomized quality systems at Keltron Equipment Complex, Trivandrum. Themanufacturing plants for Capacitors, Crystals & Resistors have been granted LCSOapproval. In order to meet the stringent quality requirements of ISRO, ESD-controlmeasures have been strictly adopted at the specified areas..